James Technologies supplies the mining and mineral processing industries with highly qualified and licensed electrical, mechanical and civil engineers and tradesmen, so as the director, I am often asked if starting a career in the mining industry is a good choice. Well, as we all know, a career in the mining industry pays well. A mining engineer for example, can be a lucrative job depending on your skills, qualifications, and level of experience. As a mining engineer, you will be asked to ensure the safety and efficiency of process involve in the development of mines and other underground operations. The role will require you to have an in-depth understanding of the effects of these structures to the environment. In return, you can expect up to $200,000 per annum. But let’s talk about salary specific information later on, first let me give you a background on the industry to help you decided if it’s the career path for you. If you’re considering starting a career in the mining industry in Australia, you’ll be happy to know that this sector is a significant contributor to the country’s economy. Currently, the mining sector employs a total of 2.2% of the total labour force. Large quantities of minerals and resources are extracted in this country including iron ore, nickel, aluminum, copper gold, silver, uranium, diamonds, opal, zinc, coal, oil share, petroleum, natural gas, and even rare earth elements. Currently a number of large multinational mining companies are operating in Australia and there are also several small mining and mineral exploration companies that are listed on the Australian Stock Exchange. These companies provide several opportunities for people who are looking to start a career in the mining industry. Click here to find out more. The Australian mining industry offers a career path for everyone. Areas that you can focus on are technical, exploring, scientific, planning and general services. If you approach problems in systematic fashion and if you enjoy technical and engineering work, the jobs that are available to you in the mining industry include, metallurgist, electrical and mechanical tradesman, mining, mechanical or electrical engineers. However, if you want to try the area of exploration, you could be a geoscientist, surveyor, field assistant, geophysicist, or resource geologist. Alternatively, you could be a haul truck operator, truck driver or a welder if you have good spatial skills and you’re curious about machinery. Having scientific knowledge can also offer you a career in the mining industry with available jobs as a health and safety officer, geological engineer, environmental science engineer or a chemical or process engineer. Depending on your skill set, you could also be a production manager, commercial business manager or a business administrator and be involved in the planning stage. Click here to find out more. It’s a common knowledge in the engineering field that the mining industry pays the highest wages. In February 2013, Australian Bureau of Statistics have released official figures confirming that this industry offers the highest level of remuneration to workers in Australia, with average take home earnings of $2,388.20. The hourly rate is reported to be at $52.30. This is considerably higher especially when compared to wages by sales workers ($607/week), personal service workers ($707/week), and labourers ($779). Of course, there is a difference in salary depending on your job. Let me give you an idea. 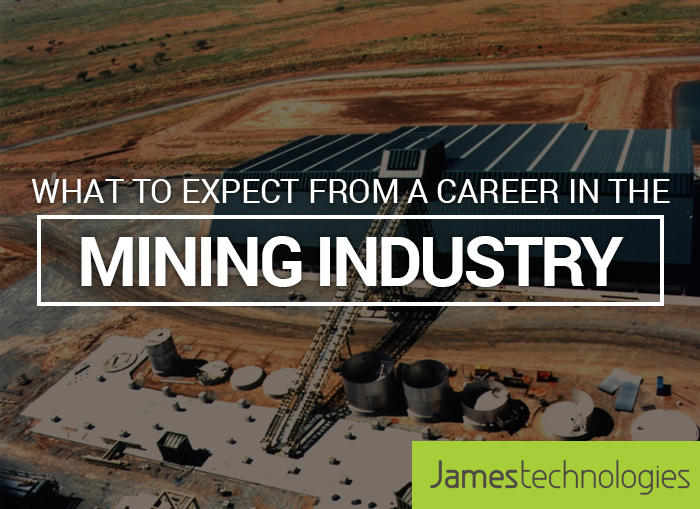 If you like the information provided in this article and you’re now seriously considering starting a career in the mining industry, get your education and training, then apply for a job here at James Technologies; a leading engineering job agencies in Australia. Being one of Australia’s biggest industries, mining can offer countless of opportunities for individuals who are looking for a lucrative job. Depending on your skills, you can jumpstart your career in the mining industry by getting the training and education required to be successful. If you’re ready to apply and get started, all you need to do is to contact James Technologies and we can assist you. Are you currently searching for electrical tradesmen to perform specialised construction related jobs that include the design, installation, and maintenance of electrical systems for either small or medium projects? Then, this article is for you. At James Technologies, our Labour Hire division supplies skilled electrical tradesmen for the building and construction, mining, electrical and mechanical supply and contracting industries. Jamestech Management has a wealth of experience when it comes to knowing what to look for in order to make a well-informed decision when hiring tradesmen. When hiring, we take a holistic view of the candidate and take into consideration various elements. Below, I discuss all the factors you should take into consideration when hiring electrical contractors. Qualification – Selecting qualified electrical tradesmen can be challenging especially if you don’t have references or recommendations. So, what do you need to look for? First is technical proficiency. The two most important considerations here are electrical system reliability and electrical safety. Thus, it is important that electrical contractors follow recognise standards of safety and quality like the National Electrical code, which is recognised Australia wide. Of course, membership in notable trade associations and high-ranking respective institution should help you in making smart decisions. Besides the qualifications, you must also be assured of securing indemnification in case of dispute or damages. License – You’ll want to make sure that all electrical tradesmen are licensed to perform the job in the jurisdiction of where the project is located. This means that the potential contractor must have in-depth understanding and complies with the NEC. This also means that the electrical contractor has at least four years of relevant experience and has passed electrical C-10 License examination. This gives you an assurance of their competence. Check the reputation – Look for electrical tradesmen who are highly recommended by previous employers, who are financially stable, and have a good reputation. If this is your first time hiring tradesmen, ask for the list of their previous employers and referees that you can contact. This helps you get an idea on their work ethic and if they have what it takes to get the job done satisfactorily. Take out the worry, Hire a full-service electrical contracting company – With contracting companies, you normally don’t have to worry if the tradesmen comply with government regulations or if they are fully licensed. In addition, this route means you’ll most likely work with tradesmen who are fully equipped to install, design, maintain, and repair industrial, residential, and commercial electrical systems and electrical projects. Such companies can typically provide and supply all electrical elements needed to complete the project. Note that your requirements for electrical services may vary a great deal. Therefore, it is my expert opinion that you hire electrical contractors who can provide wide range of services, that way you can be assured that they can offer you with solution for each electrical problem that you may encounter. Dealing with one reputable company for all your needs is definitely easier than dealing with several individual electrical tradesmen. Ask for a quote – If you need an electrical contractor for a specific project and will not be paying them a salary wage, it is important that they give you a detailed quote. When they present their quotation, the figures must be reasonable, within your budget, and price expectations. Also, if you’re considering several electrical contractors for your project, don’t hesitate to shop and compare. Keep in mind that those who charge the highest do not necessarily mean that they are the best. 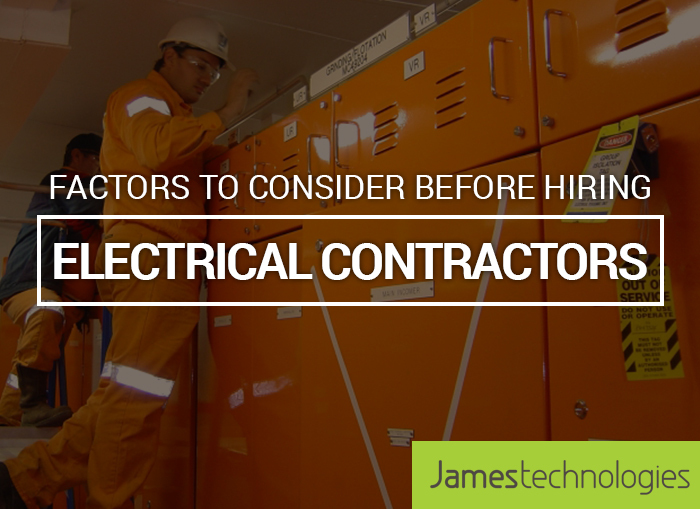 There are several factors to take into consideration before hiring electrical tradesmen and contractors. To ensure you hire reliable and qualified electrical tradesmen you need to practice due diligence and do some research to make sure that you make a wise decision when choosing the personnel or the company you’ll be working with. Be sure to look at their qualifications, license, and reputation or consider hiring a full-service electrical contracting company. By following my recommendations listed above, I’m sure you’ll be able to compile a list of electrical contractors without too much difficulty. Bigger is not always better, here at James Technologies, we provide personal electrical contracting services tailored to each customers needs. Due to the fact that we have Electrical Contracting and Engineering Licenses Australia wide, we are capable of providing you with comprehensive EPCM contractors for both small and medium size project. If you have questions all you need to do is to give us a call. Our phone number is 1 300 732 881. Contact us now and we’ll be ready to discuss your needs. 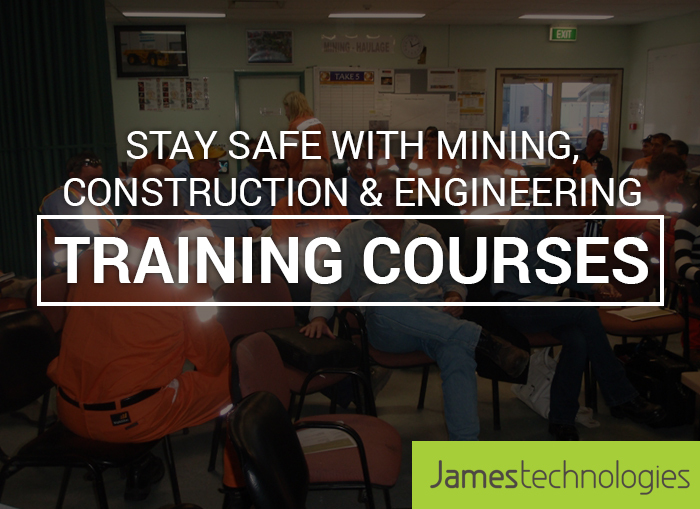 As a registered training organisation, here at James Technologies we know just how important training courses are for the mining, construction, and engineering industries. These training courses, which include first aid training, mine inductions and compliance audits, are specifically designed to keep staff safe in the workplace and to make sure that they follow established protocols and regulations to ensure a zero harm workplace. Ensuring that your staff has general knowledge on how to work safely and without risks to health. Developing a positive health and safety culture. Avoid accidents in the workplace. As an employer, making sure that your employees attend training courses will help you meet your legal duty to protect the safety and health of your employees. This can also help you avoid the financial costs of ill health and accidents that are not covered by your insurance. Safety is the number issue in the field of engineering. Due to the fact that accidents are often reported on-site, safety and first aid skills are something that employees need to learn before they carry out their jobs. This is where first aid training, which covers several qualifications, comes in. First aid training covers DRSABCD action plan, cardiopulmonary resuscitation, use of an automated external defibrillator, medical emergencies, bites and stings, and trauma & emergencies. Tailored to the engineering industry – First aid training programs can be tailored fit to your workplace, current risk management strategy, and the industry in which you operate. Here at James Technologies we make sure that your First Aid and CPR training are focused on the requirements of your business. Cost – The main purpose of giving your employees the appropriate training is to make sure that they remain safe in the workplace. Providing training for everyone can help you significantly reduce, if not eliminate the numbers of accidents and their severity. This actually offers great financial impact on your business in the long run. Boost employees’ morale while ensuring their health and safety. Employees are more likely to appreciate their job and be good at what they do if they know that necessary precautions were taken to make sure that they remain safe while in the workplace. First Aid and CPR training save lives. Perhaps, the biggest benefits of first aid training is that it can save lives. In circumstances where accidents resulted to the need of immediate medical attention, trained personnel can offer first aid instead of just waiting for the ambulance to arrive. If mining is your business, getting your employees to attend a generic mining induction course is non-negotiable. This covers surrounding safety, procedures, policies, and risk control. Participants are also taught about their responsibilities regarding WHS and the required documentation that are relevant to working in a mine. This training, which typically runs for two days, covers both theory and practical related mining scenarios. Click here to find out more. A compliance audit is a comprehensive review, which are carried out by IT consultants, independent accounting or security officials, to ensure that an organisation adheres to regulatory guidelines. They review your compliance to relevant laws, act and regulation, reviewing policies, risk management procedures, and user access controls among others. Jamestech can develop training courses for our customers and their employees, specific to their needs, to ensure compliance to relevant regulatory requirements. Click here to find out more. Safety is the number one priority in any type of workplace. As an employer, you would want to make sure that your staff are safe and aren’t in harm’s way when they’re fulfilling their duties. Giving them training courses, can help you make that happen. If you’re in the process of looking for an accredited organisation that offers first aid & electrical safety training, custom & generic mine inductions, and even high voltage training courses & compliance audits, know that you can count on James Technologies. Electrical power engineering as a Career, what you can expect? As a licensed electrical contractor that specialises in electrical engineering recruitment, we are regularly asked about electrical power engineering and what one can expect should they consider it as a career. As long as you are qualified, competent and confident, which include educational attainment, experience, expertise and certifications, then electrical engineering is indeed a financially rewarding job. What is electrical power engineering? Electrical power engineering is a subfield of electrical engineering that generally addresses the problems of three-phase AC power and in the conversion between AC and DC power. It basically deals with power transmission, power generation, and power distribution. It is also involved in the development of specialized power systems such as those that are used electronic railway networks and aircrafts. With a greater emphasis on green technologies and the rapid transformation that occurs across industries, electrical engineers are expected to play an extremely important role in our society’s future. How do I become an electrical power engineer? If you’re thinking about starting a career as an electrical power engineer, it’s important for you to know that you’ll be given the opportunity to do your share in addressing global challenges including environmental preservation, climate change, renewable energy generation, sustainability, and even healthcare. The first requirement of becoming an electrical power engineer is to get the needed education and qualifications. There are several electrical engineering courses you can take advantage of depending on your career goals. Your first option is to complete a four year Bachelor of Engineering (Electrical) degree which offers specialised areas in computer and bioelectronics, telecommunications, and power. You can also take advantage of a five year degree program that is combined with law, medical science, arts, and commerce. It’s crucial that you take undergraduate programs from institutions that are accredited by Engineers Australia if you want to start a career in this country. There are other programs that you can take advantage of after completing a four or five degree program. These postgraduate programs provide mathematical, scientific, and engineering foundations that are required if you want to specialise in high-performance computing, satellite communications, signal processing, telecommunications, biomedical engineering, and energy generation. Find out more from the University of Sydney’s website. Aside from educational attainment, there are also certain skills that you need to possess. These include general understanding of power plants, awareness of efficient design system, and the ability to optimise a process for maximum efficiency. As electrical power engineering is an evolving profession, it’s crucial that you are willing to think outside of the box and that you are willing to gain new skills. It’s also a must that you are updated with the latest technologies and latest research in this field. What is the salary for electrical power engineering? 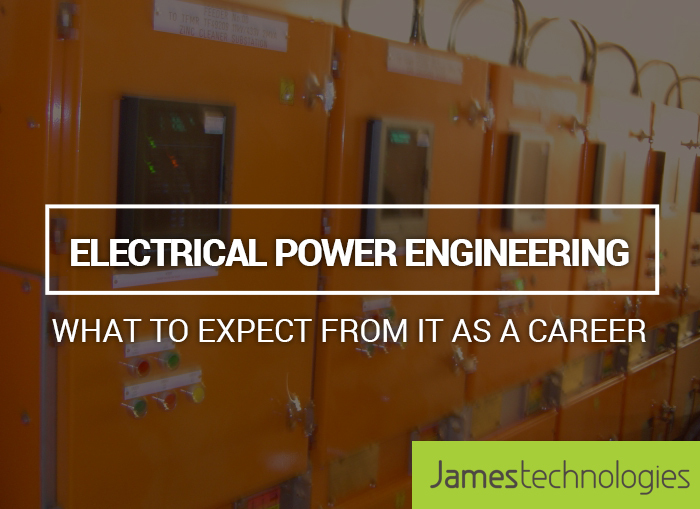 When electrical power engineers apply for position here at James Technologies, one of the questions that they usually ask during interviews is the salary. Well, as mentioned above, starting a career as an electrical engineer is financially rewarding. In Australia, the starting salary for junior power electrical engineers starts at $65,000 per annum. This increases to as much as $200,000+ per annum for engineers who are able to work up the ladder to senior level position. Keep in mind that salary can vary according to your educational attainment, years of experience, employment, and expertise. Currently, the average hours for full time electrical engineer are about 42 hours per week. Find out more from Open Universities Australia’s website. If you’re wondering what exactly it is that an electrical power engineer does, then it’s a good idea to understand the job description. As an electrical power engineer, you will be tasked to design and develop renewable utility systems and energy efficient power grids. You will also be involved in researching and implementing techniques to efficiently integrate renewable power technology, which may involve public work projects or federal projects that require the integration of large power grids. Power engineers are expected to maintain network of components to effectively convert forms of energy into electricity and to manage the transmission subsystem, generation subsystem, and the distribution system. They are also responsible for various devices used in this field, which include motors, generators, and transformers. However, the most important duty that they need to perform is to ensure that all electrical devices are working properly and that they meet safety regulations. Read more of the Job Description for this link. If you’re thinking about starting a career in electrical power engineering, it’s crucial that you have the needed education, skills, and knowledge of the established processes and protocols in this field. Whether you’re looking to hire electrical engineering contractors or you’re looking for an electrical engineering job, know that James Tech can be of assistance to you. Our phone number is 1 300 732 881 while our email address is info@jamestech.com.au. We’ll be more than happy to assist you.